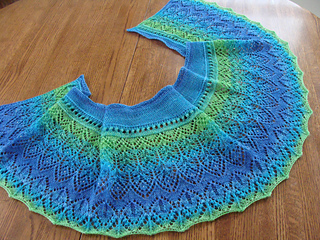 Pattern contains charts and a little bit of written explanation, but it doesn’t cover the same part of the shawl. So you need to be able to read charts. Also available as part of an eBook collection at a very favourable price! 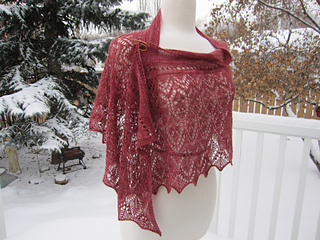 If you want to make more than one of the shawls, go for the eBook. 2 skeins of Malabrigo Yarn Lace, 100 % merino (470 yards (430 m) per 50 g skein). Shawl as shown uses 1.6 skein or 752 yards (688m). Size after blocking: 20’’ x 63’’ across(50 x 160 cm) Innercircle 47’’ (120 cm). Construction:The shawl is worked in one piece, from the bottom up. After Chart A, you will work a transition according to the written directions and after that short rows in stockinette stitch. If you want a larger shawl, use heavier weight yarn and/or larger needles. Experienced knitters will find it easy to add repeats of the edge.